Sharing is Caring – Why Openness is key for true empowerment and sustainability? 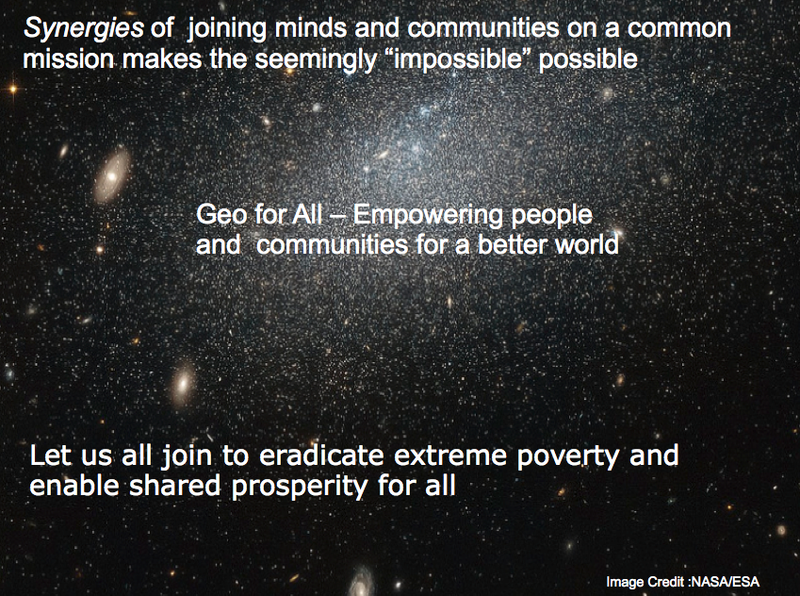 “Geo for All” was started from nothing but the synergies of joining brilliant minds and communities worldwide on a common mission makes the seemingly “impossible” possible. As we did not have any initial funding , we had gone through lot of difficulties in our initial stages but it is thanks to the support of our amazing colleagues globally who are all our GeoAmbassadors that we were able to achieve our amazing growth. It is my great pleasure to introduce our Geo4All colleagues at the National Bureau of Surveying (Dirección Nacional de Topografía – MTOP), Montevideo ,Uruguay. 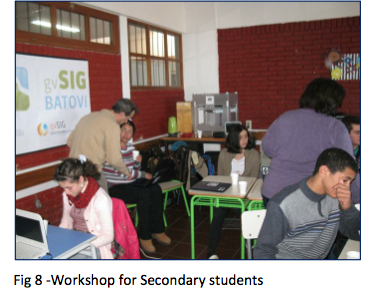 The amazing work that Sergio Acosta Y Lara and colleagues in Uruguay have done through gvSIG Batovi initiative has been an inspiration for all of us. gvSIG Batovi is an excellent example of a successful initiative in Open Principles in Education and helps us to understand why scalability and costs for scaling is fundamental . This is a good example of scalability of education opportunities with very little resources using Open Principles. Imagine if all these hundreds of schools and thousands of students had to depend on buying software and data for their teaching and learning. This simple idea can be scaled to millions of schools globally .This empowerment of educators and students is the true essence and gift of Open Principles. 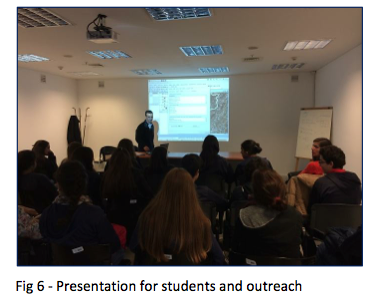 Through their focus on Open Principles in Education they have now provided high quality spatial technologies education to students in all schools across Uruguay . Thanks to the Plan Ceibal they also have free laptops for all Primary and Secondary students in the country so they truly have the opportunity to reach every student no matter they are rich or poor with high quality teaching and learning tools. 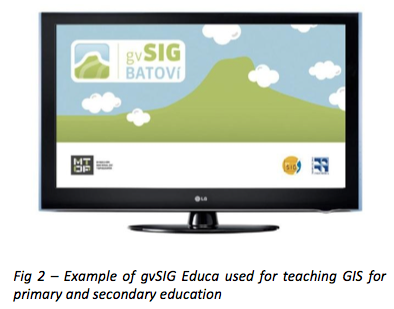 gvSIG Batoví is a GIS (Geographic Information System) software tool applied to educational environments driven by the National Bureau of Surveying (Dirección Nacional de Topografía – MTOP) for the Plan Ceibal (OLPC initiative for Uruguay), through which Primary and Secondary students can acquire knowledge of geography using laptops through informative and interactive information. 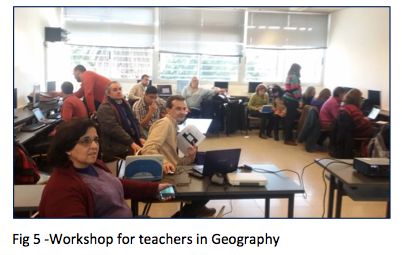 The tool, after its launch, became the first Uruguayan distribution that gives rise to gvSIG Educa (Fig 2), which aims to be a tool for educators to provide students a better analysis and understanding of the region, as well as collaborate with the assimilation of spatial concepts using visual tools. 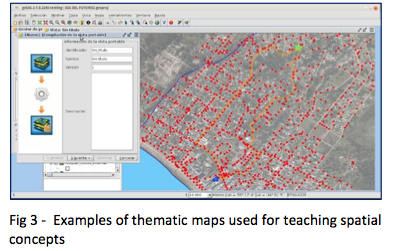 It also provides the possibility to both teachers and students to develop their own thematic maps from different layers of spatial information available turning the learning process in a much more attractive, motivating and interactive one (Fig 3). Through our new initiative of Geo4All Schools we aim to use geotechnologies as a usecase to advance STEM interest in Schools through Open Principles so that students develop creative minds and develop to be future thought leaders and creative thinkers to help solve global challenges (not just to be just users). 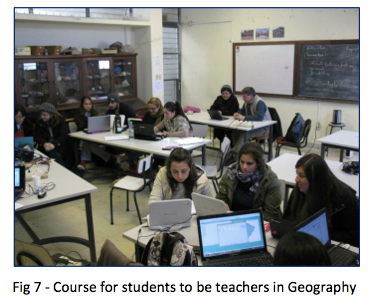 We are already making huge impact from thousands of schools in countries like Uruguay to Spain and thousands of universities worldwide are now benefiting from Open Principles in GeoEducation . Ideas that starts from nothing are very powerful and keeps expanding exponentially . The bigger aim is to also to advance STEM education across the world and bring together schools, teachers and students across the world in joint projects and help building international understanding and global peace.